Army always ding some civil and welfare work under the operation “Sadbhavna” all over the country. 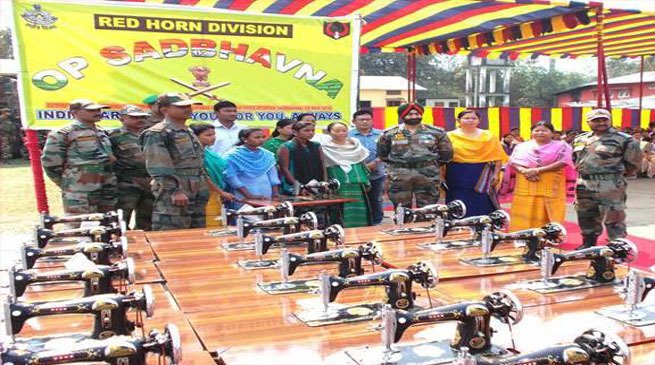 Under this operation Sadbhavna, Indian Army distributed 30 Sewing Machines to the women of poor economic background from Kokrajhar District on 10 Mar 2016. Apart from this, Army also provided 20 Bunk Beds to the children Alayaran Anath Ashram. During the distribution ceremony, children of orphanage, Beneficiary women and representatives of civil administration were also present. All attendees expressed their gratitude and thanked Indian Army for carrying out such proactive work to help the needy.